Before: This x-ray shows a lateral central incisor (a front tooth) with a dark round area at the end of its root--a typical sign of a tooth infection due to tooth decay penetrating into the nerve of the tooth and causing the nerve to deteriorate. The patient had experienced pain and swelling with this tooth, along with an poor-tasting discharge. I decided that the tooth required a root canal in order to treat the infection. After: When I opened the tooth, I noticed that there was no bleeding and no sign of a living nerve. The nerve of the tooth had died. When a tooth nerve dies, bacteria can grow inside the tooth and feed on the remains of the dead nerve. The bacteria create toxins and irritants that cause inflammation at the end of the root (shown as the dark spot on the x-ray at the tip of the root). The body's immune system cannot attack the bacteria inside the tooth because the blood stream, which carries the immune system's cells, cannot flow into a dead tooth's root. A root canal is therefore required. A root canal is where the tooth is opened, and the dead nerve tissue is cleaned away. This removes the "food" that the bacteria need in order to grow. When the nerve is cleaned away, the tooth is left with an empty, hollow root canal space. This space is then filled to block it up and prevent bacteria from entering the space again. 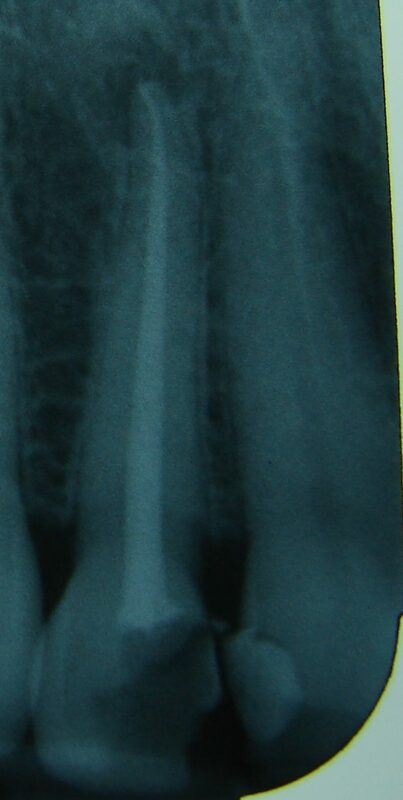 The root canal filling shows up as the white line on the x-ray. The root canal I performed here densely filled the entire canal to the end of the root. The bacteria that was in the tooth was thus forced out of the root canal, so that now it can be attacked and destroyed by the immune system. Over the next year, the dark spot in this x-ray will heal up as the body clears the infection and re-grows the bone in the area that was broken down by the infection. 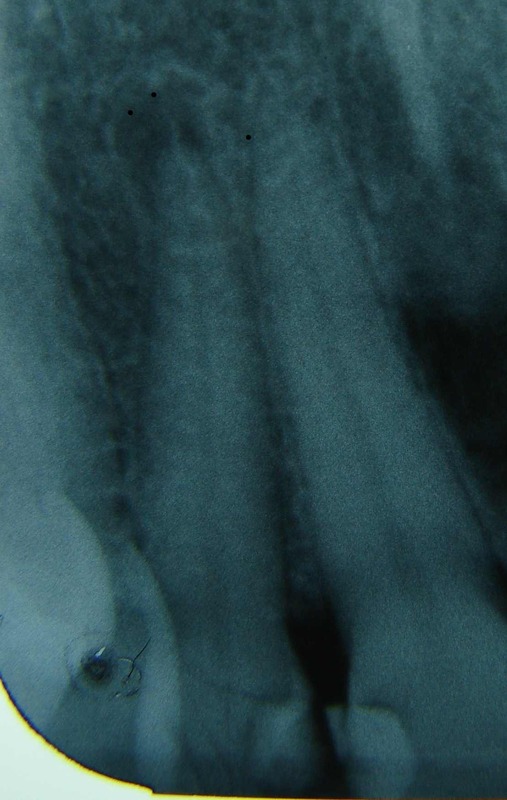 Root canals allow a patient to keep a tooth that otherwise would have needed to be extracted due to an infection.